David Archuleta is an American pop vocal artist. He was the runner-up of season 7 of American Idol. 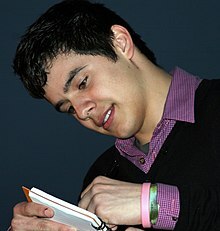 Archuleta was the runner-up of "American Idol" 2008. He had the singles "Crush", "A Little Too Not Over You", "Angels", and "Touch My Hand". He released the album David Archuleta in November 2008. 2009 - "A Little Too Not Over You"
This page was last changed on 1 February 2019, at 14:44.